Emblem Unlined Greyboard is a highly versatile product that’s perfect for use in a wide range of arts and crafts projects and printing applications. Emblem Greyboard is perfectly suited to a variety of applications, including mounting boards, pad backing, picture backing for frames, protective packaging and rigid boxes, jigsaws, book binding, toy manufacture and all manner of related uses. 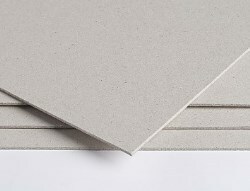 Emblem grey board paper is produced from 100% post-consumer waste. This product has been specially cut to 570x295mm size. Please see notes in product details page.